yeah Itzkin is a total hacker. Bloom you gaylord are you back? Have they released you from the section 3? on a 117. A lot has changed since you been away: Ive retired from sniping!!! Not touched my long weapon for weeks. Im cured. One thing will never change: Mary is still crap. You're right, lots of things has changed. We recently found out that Daz is locking himself and his women in his room. Then he push them down the stairs. 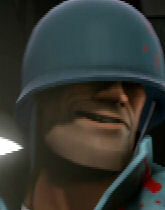 And shut it, pink engie rager.